Not only is peppermint everywhere during the holidays, it’s pretty standard throughout the rest of the year, too. Peppermint extract and peppermint oil are used respectively to flavor and fragrance a variety of things from food and drink to soap, toothpaste, and mouthwashes. Peppermint is a sterile, hybrid plant that’s made up of a blend of watermint and spearmint. First known to be cultivated in England during the seventeenth century, its popularity grew to the point where it’s now cultivated all over the world, though it remains indigenous to Europe. In the United States, Oregon is the leader in peppermint production, accumulating nearly 35 percent of the nation’s total supply. Here, peppermint is planted in the late fall or spring and then harvested during the summer months. When it’s ready to be harvested, the peppermint plant is cut and windrowed, and then dried out and sent to a distillery to extract the oils. Thinking about peppermint may incite memories of Christmas foods and the candies found at grandmother’s house, but its versatility reaches even further. Before the invention of the pacifier, people would give their children sugar sticks to soothe them. These sticks eventually moved on to become peppermint-flavored, with a prominent red stripe design (what we know today as candy canes). Peppermint has a cool and refreshing menthol flavor, which is why it’s often found in gums, mints, and oral care products since it provides a super clean feeling. Peppermint leaves can also be used to make tea and other flavor extracts. In particular it tastes great with chocolate and is often featured in many baked goods and hot beverages like mint hot chocolate and mochas. All by themselves, fresh peppermint leaves have just a few calories. It’s always best to source fresh peppermint for food purposes since the flavor will be more intense. When storing, simply wrap the leaves in a damp paper towel and place into a plastic bag. If there are any noticeable dark spots or yellowing, that’s your clue that it’s time to throw them out. Dried mint or peppermint extract is traditionally kept in the spice cabinet and can remain good for up to twelve months. Peppermint may also be found in your medicine cabinet. Although not a medically-approved remedy, essential peppermint oil can be therapeutic in a number of ways. Rubbing some peppermint oil at the temples might be able to ease the throbbing pain of a tension headache in the frontal lobes. When applied topically to sore spots, the cooling sensation (supplied by the menthol found in peppermint) can help to soothe tired muscles, an achy back, and painful joints. You can also add a few drops of oil to hot water in the tub for a soothing bath. Mix peppermint oil with lavender oil to help cool and calm itchiness or redness caused by minor irritations. 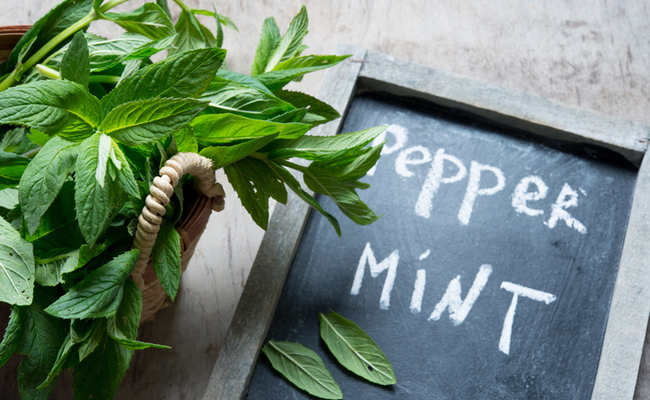 In the case of bug bites, peppermint has also been tried by some as a natural repellent. Try adding some drops of essential peppermint oil to a water bottle, dilute it, and then spray on your body as a way to turn away mosquitoes. You can also spray in corners of the home to try and ward off ants and spiders, too. The refreshing properties of mint help to provide a cooling sensation that can draw the heat away from sunburns and take away some of the sting after being exposed. Peppermint has also been seen to act as a natural decongestant and expectorant (which is often why it’s used in vapor rubs to help clear up nasty coughs and colds). Add a few drops of the oil to a diffuser, and breathe in the mist to help open up airways and possibly alleviate sinus pain as well. Wonder why peppermint is always added to toothpaste? It’s for more than just the flavor. Peppermint can help to freshen breath and possibly prevent cavities. Its antimicrobial properties help keep toxins away that could otherwise build up and contribute to dental issues. Peppermint mouthwash, floss, gum, and mints also do the same trick, as does just chewing on peppermint leaves. The same antimicrobial properties in peppermint have been seen to impact digestive issues, too. These compounds have been studied for their ability to activate an anti-pain channel in the colon that can reduce pain and spasms. This might be able to provide some relief for upset stomach, diarrhea, gas, cramps, nausea, vomiting, even morning sickness. One of the most effective ways to receive these benefits is by drinking peppermint tea, which steeps the leaves with water for a warming drink. While you can source the leaves yourself, you can also buy boxed tea bags to make it more convenient. The benefits of peppermint in its various forms are vast and plenty. Next time that candy cane hits the desk think twice about giving it to the kids or throwing it in the trash can. It just might do more for you than provide a sweet treat.